An unsung hero of Indian cricket, opener Wasim Jaffer proved his worth once again in the domestic circuit as cruised his way to yet another first-class century – this time for Vidarbha against the Rest of India in the Irani Trophy 2017-18. 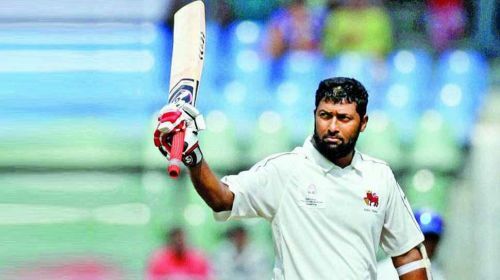 The man to win every Ranji final for his domestic side – whether Mumbai or Vidarbha – Jaffer eased to a massive 285* at stumps on Day 2 of the match, in the process crossing 18,000 first-class runs and at 40, became the oldest Asian to slam a 250-plus score in a first-class game. While representing India in the international arena, Jaffer had put his hand up on multiple occasions when called upon. The fact that three of his five Test centuries came away from home, including a memorable 212 at St John's in 2006, shows how reliable the right-hand batsman was while playing for India. But fate would so have it that he would end up with only 31 Tests since his debut as far back as in 2000, with the presence of the more glamorous Virender Sehwag and Gautam Gambhir denying him a place for the most part of the early 21st century. After playing close to two decades for 41-time Ranji Trophy champions Mumbai, the veteran batsman decided to shift base in 2015 and moved to Vidarbha at the age of 37. After two forgettable seasons with Vidarbha, Jaffer turned up for the 2017-18 season in style, playing a pivotal role in Vidarbha's maiden Ranji Trophy triumph. Post the Ranji Trophy success, Wasim Jaffer spoke exclusively to Sportskeeda at length about Vidarbha's phenomenal run and the secret of his success which earned him the title of Domestic Legend. Why did you decide to shift to Vidarbha after playing for Mumbai for so long? How different is the cricketing culture of these two teams? I was getting tempting offers since 2008-09 after being dropped from the Indian side. I wasn’t up to it since I had ambitions of making it back to the Indian team. Also, I was made the captain of the Mumbai team which was long due after representing the side for so many years. In 2013-14 after the injury in the Ranji Trophy, I missed the entire season. Many youngsters were coming in (the Mumbai team) with the aspiration to represent the Indian team. I didn’t want to hamper their chances. It was after that that I felt it was the right time to move on to other team where I would have a different role to play; a team where I could add value to the team and players. That made me choose Vidarbha. How different is the cricketing culture of Mumbai and Vidarbha? You can’t compare Mumbai culture with any other team. Mumbai has won Ranji Trophy 41 times and the second best is Karnataka with 8 wins. So, no other team is even half as close to Mumbai. According to you, what is the reason for Vidharbha’s remarkable show in this Ranji Trophy? If you have to state top 3 reasons, what would they be? The biggest difference between this year’s team and the past has been the presence of our coach, Chandrakant Pandit. He has made the players work hard and made them believe that they can win. Earlier, Vidarbha played well at home and struggled in away matches. This time we have won at neutral venues. We have defeated Bengal in Bengal, Goa in Goa and Punjab in Punjab. How much has BCCI’s neutral venue approach helped Vidarbha and domestic cricket at large? The purpose of neutral venue has been to acclimatize the players with different playing conditions, making them ready for the bigger platform. The crowd turnout is a bit of a dampener in this scenario but in the larger picture, it is helping the young cricketers a lot by giving them the required exposure. Having neutral curators too has been quite beneficial. Cricketers are not playing on a single type of wicket anymore. As a senior player in the team, what was your role? How did you help and guide the youngsters? What were the management’s, coach’s and captain’s expectations from you? Everyone’s role was well defined. Every team goes into a big tournament with the aim of winning but it’s all about churning out good performances when the time comes. And, we did just that. With a bit of luck at our side and by God’s grace we have performed well just when it was required. You have been a part of 9 Ranji finals and on all these 9 occasions, your team has gone on to win the coveted trophy. If you have to choose one amongst these 9 outings, which one is closest to your heart? I think the one where I was captaining and we won against Karnataka by just 5 runs. It was an away game and we were playing against a crowd of approximately 15000 people who were rooting against us. After that, this win (Vidarbha’s maiden Ranji win) is the second closest to my heart especially because at the start of the tournament nobody thought that Vidarbha could win. Is there a mantra to win the Ranji final? You need to believe in yourself and follow the process where all the members of the team are working towards one single goal of winning the title. And then deliver when the time comes. The teams who can do it are successful. Which is your favourite inning in this season and amongst all the Ranji innings that you have played? This season, it was the inning I played in the finals. Although I couldn’t get a century but it came in at a very crucial point. Ranji Tournament is a high pressure one in the Indian domestic circuit. With experience on your side, what is that one message that you would give out to youngsters in the domestic arena. As a batsman when you get 800-1000 runs and as a bowler you get 35-40 wickets, you gain a lot of respect from your opponents and your team. It is very important to play Ranji Tournament. Playing the longer version of the game tests you on many levels like your temperament, fitness etc. The misconception has been reigning high that a good IPL performance can bag you a spot in the Indian team but then that’s not the only criteria. Back your IPL performance with a good Ranji performance. Playing white ball cricket is easier than red ball cricket. You have played in the domestic circuit for long. You are the highest Ranji scorer with 10,665 runs under your belt; after all these years, what is it that keeps you going despite negligible chances of making it to the national squad again? I realized this (not making a comeback in the Indian team) a couple of years ago. The way Indian team is playing and operating, it’s fair enough. India cap obviously out of reach now but I don’t prefer thinking about things that are not in my hands. It’s the love of the game that keeps me going. Playing cricket and going out and scoring runs, getting a century still give me a lot of happiness. As long as I am fit and enjoying playing the game, I’ll keep playing. In the international circuit, which is your favourite innings? The innings where I got a double hundred and the inning in Cape Town where I became the only Indian opener to score a Test century. As a team when we won a series in West Indies after 35 years and in England after 24 years. These are the feats I am very proud and honoured of. I am fortunate that God has given me an opportunity to represent my country and add value in whatever little way I could.